If you’re a cat lover, then you’re probably aware that catnip can make cats pretty goofy. But, did you know that not all cats react to catnip? You might also be wondering if there is a limit to how much catnip is safe for your cat. Are there other substances besides catnip that have a similar effect on cats? As with anything, cats should eat in moderation as well as humans, whether it’s jerky or chocolate! 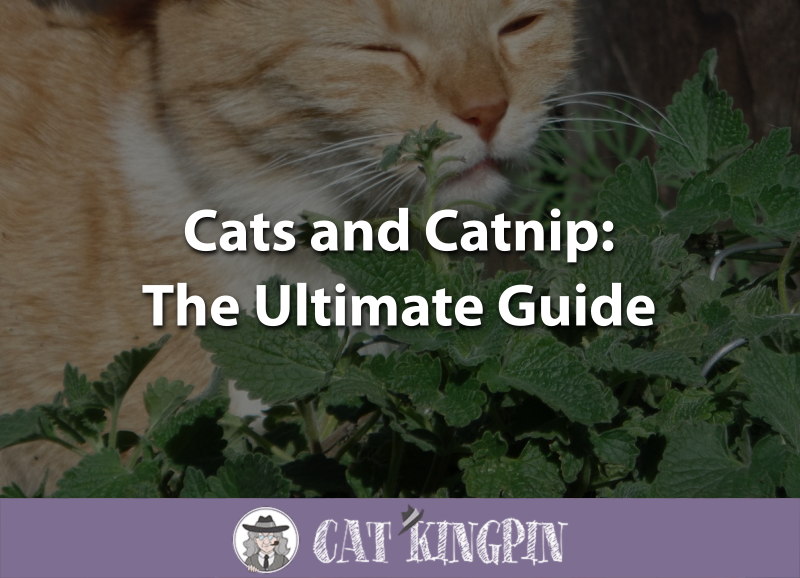 Well, brew yourself some herbal catnip tea and sit back, because you have before you the ultimate guide to all things catnip. Where Does Catnip Come From? What is Catnip Made Of? Can Kittens Play with Catnip Toys? Can You Grow Your Own Catnip? You probably already know that catnip is a type of plant. Known scientifically as Nepeta cataria, catnip is also known as catswort or catmint depending on what part of the world you’re in. Catnip is actually closely related to mint plants and shares many properties with them. Like mint, catnip can grow up to 3 feet tall. The catnip plant is native to southern and eastern Europe, the Middle East, central Asia, and parts of China. Through cultivation, people have spread catnip throughout the world and it can now be found growing wild in northern Europe, New Zealand, and North America. Catnip is farmed commercially in places like North Carolina. Catnip seeds are very small and are difficult to sow directly into a field. So, instead, seedlings are used as transplants. Once harvested, catnip is sold to health food stores for use in herbal tea mixtures, as well as to cat owners and manufacturers of cat toys. Those sure are some lucky cats! When we talk about the catnip we give our cats, we’re referring to a specific preparation of the harvested leaves and stems. The catnip plant is first dried, and then chopped into a mixture of leaves and stems or ground into a rough powder. The composition of catnip and the chemicals it contains have been studied extensively. The chemicals in catnip seem to affect both humans and cats, though quite differently. Some products marketed as catnip may actually be other plants, such as Tartarian honeysuckle, valerian root, and silver vine. These plants contain chemicals which can have similar effects on cats as true catnip. Scientists have identified nepetalactone as the chemical that attracts cats to catnip. Nepetalactone is an organic, aromatic compound that belongs to a class of chemicals known as iridoids. When a cat sniffs catnip, nepetalactone molecules are absorbed into the nasal tissues, binding to specific protein receptors. Through a cascade of neuronal stimulation, a response is provoked in two important regions of the cat’s brain: the amygdala and the hypothalamus. While the neurochemistry is quite complex, these regions of the brain mediate emotional and hormonal responses to stimuli. It’s thought that cats have something similar to a sexual response when they sniff catnip. The nepetalactone chemical in catnip can also be found in the wood of tartarian honeysuckle. Shavings of this invasive bush are sometimes used as an alternative to catnip in cat toys. Since the effects occur primarily through the nose, cats generally sniff catnip more than they actually eat it. Of course, there are probably going to be a few felines out there who are going to munch some catnip from time to time. It’s not uncommon for cats to eat some plant matter. While plants aren’t a dietary requirement, small amounts of non-toxic plants seem to be an interesting change of pace for some cats. Ingesting moderate amounts of catnip shouldn’t cause your cat any harm. However, if they do eat too much, they could experience gastro-intestinal issues. Being a plant, catnip contains moderate amounts of dietary fiber. Cats don’t need fiber in their diet. When a cat eats food containing fiber, it can have a laxative effect on the cat resulting in runny stools. You should also know that kittens are likely to be even more sensitive to the bloating and laxative effects from the fiber in catnip. This could cause abdominal discomfort and diarrhea, possibly leading to dehydration and a trip to the vet. It’s unlikely your cat or kitten will actually eat enough catnip to cause them any problems. However, to be on the safe side, watch closely the first couple times you give them catnip to make sure they’re enjoying it appropriately. Just like humans, some cats have a tendency to over-indulge. Whether it’s food or catnip, certain cats just can’t seem to get enough. We know that eating too much food can make your cat obese leading to numerous health problems. But, is too much catnip harmful to your cat? Luckily, catnip is about as close to nontoxic as you can get, with no proven negative health effects. Unlike drugs, catnip is not addictive, and there are no reports of cats dying directly from excessive catnip consumption. While cats may not suffer any harmful effects from too much catnip, exposure to large quantities will eventually fatigue the receptors in their nose. This usually happens somewhere between 5 to 15 minutes after first exposure to the catnip. Once fatigue sets in, the receptors in the cat’s nose will no longer react to the catnip. When this happens, your cat no longer experiences stimulation from the catnip and will likely lose interest. After about an hour, the receptors start to reactivate. Then your cat can once again enjoy the catnip high. Kittens are fine to have catnip from time to time. In the past, it was thought that giving catnip to kittens when they were very young could result in behavioral imbalances. This kitten is definitely having one of the energized responses cats can have to catnip that we’ll talk about more below. 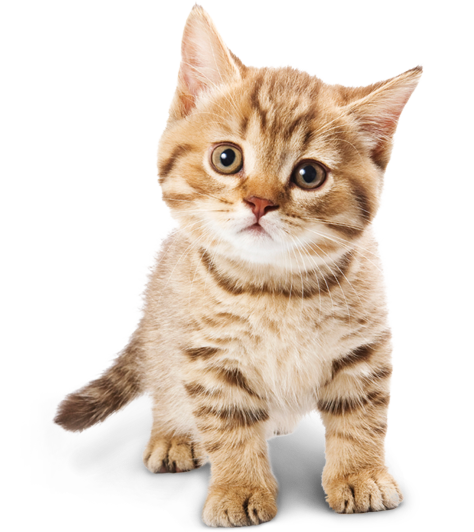 One thing to keep in mind, however, is that most kittens don’t seem to be affected by catnip until they’re three months old. Since they’re already busy exploring everything that’s new to them in the world at that age, they’re not really missing out on anything if you wait to give them catnip until they’re a little older. Since catnip is safe for kittens, they can freely have a great time with most catnip toys. The main thing to be concerned about is whether the toy itself is appropriate for the age of kitten playing with it. Many cat toys have strings that could become wrapped around them or small parts that could be chewed off and become a choking hazard. Kittens don’t have the same level of experience with different objects, so they should be monitored closely whenever you give them a new toy. If you’re looking for a safe, durable catnip toy for your kitten, check out the Easyology Cat Toys Interactive Pizza. It’s both a catnip-filled toy and a place for your kitten to nap after a hard play session. Each cat’s reaction to catnip is unique. Some act the same way every time they’re exposed to catnip and others exhibit a variety of behaviors that are always different. Cats can also act differently when they’re using catnip alone versus when there are other cats around. A few even get somewhat aggressive with other cats trying to share in the experience. Cats’ reactions to catnip can generally be broken down into three categories: crazy, lazy, or no reaction to all. Crazy cats can show a variety of behaviors, including jumping around, scratching, biting, sniffing, chewing, rolling, rubbing, batting the catnip, and kicking with the hind legs as they would when capturing prey. The third reaction to catnip that you might see is no reaction at all. In fact, only about 75% of cats respond to catnip. Studies indicate that a cat’s susceptibility to catnip is genetic. Cats require at least one copy of a certain dominant gene to feel the catnip high. Fortunately, even if your cat doesn’t seem to feel a rush from catnip, there is still a good chance they may feel effects from Tatarian honeysuckle, valerian root, or silver vine. Other species of cats, such as leopards, cougars, servals, and lynxes, have also shown strong reactions to catnip that are very similar to domestic cats. Lions and tigers also seem to fall under catnip’s spell, though not as frequently as our house cats. One substance that warrants a bit of caution is catnip oil, which is the distilled extract of the catnip plant. Catnip oil is produced through a process of steam distillation and extraction with an organic solvent. Catnip oil is generally sold in two different forms. One is a concentrate often sold as an essential oil for humans, the other is a diluted spray that can be applied to cats toys. Catnip oil is said to have a calming effect on humans and is also used by people as an effective bug repellent. It’s this concentrate that is more of a risk to your feline companion. The LD50 of catnip oil, which is the amount that is toxic for cats, has been found to be around 1300-1500 mg/kg. Therefore, the lethal consumption level for an average 11-pound cat would be about 8 grams of catnip oil. Put another way, an average cat would have to drink a half a tablespoon or more to be at risk. While this is unlikely, it’s not impossible, so concentrated catnip oil bottles should be kept out of reach of the kitties. While it’s possible to distill your own catnip oil, a better choice for your cats is a diluted spray like KONG Naturals Catnip Spray for Cats. Since you’re only misting your cat’s favorite toy with it, the amount of actual catnip oil is small and there’s no real risk of toxicity to your cat. You can grow your own catnip! The seedling plants are the easiest to grow and are available in most nurseries. Catnip can also be started from seed. Easily mixed with other plants, catnip blooms in mid to late summer with white or purple flowers. It needs full sun, but is very hardy. It’s actually hard to mess up growing catnip, and you’ll likely see it come back year after year. Be careful though, if you have outside cats, as they will likely ravage your catnip garden. Cats will often pull the plants all the way out of the ground. Once you do get your outside catnip established, you can simply pull off fresh clippings and give them directly to your cat. They’ll love it! You can also harvest and dry your catnip so you have some stored up for later. Catnip is most potent when it’s flowering, which is the best time to harvest. Air Drying. First, cut the stem, leaves, flowers, and all. Then, bundle them together and hang them upside down in a cool, dark place. The plant is fully dry when the leaves begin to crumble. Oven Drying. You can also dry your catnip in the oven. Simply spread the cut plants out on a baking pan and bake them at the lowest setting for several hours. The catnip is sufficiently dry when the leaves become crumbly. Herb Dehydrators. Just spread the leaves, flowers, and stems on trays and dehydrate for 6-8 hours. Many food dehydrators will also have an herb setting you can use. If you’re going to grow outdoors, you should also be aware that catnip in your garden is prone to become an invasive species that spreads throughout your yard. One solution that’s often used for mint is to plant them inside an open-bottomed barrier that’s at least 18 inches deep. Catnip can also be grown indoors as long as long as you can give the plant ample sun and regular waterings. If you want to give indoor catnip growing a shot, try out this Catnip Growing Kit. Now you know all about cats and catnip. Now you know that catnip is a fun and safe form of entertainment for your cat. You even know a little about how catnip works on your cat’s brain. As it gets many cats amped up, catnip is a great way for your indoor cat to get a little bit of the exercise they need. And, certainly, it’s good for us to get a good laugh from time to time. If you want to see just how much of an effect catnip can have, check out Cats on Catnip. This book by Andrew Marttila captures dozens of cats’ silly and expressive personalities as they react to catnip. But, even more fun is giving your cat catnip. Catnip can be given as flakes, in toys as a powder, or even sprayed on as a mist. You can even grow your own catnip. And if your cat is one of the unlucky few who doesn’t react to catnip, don’t fret. Many cats have catnip-like reactions to valerian root and silver vine. Catnip is fun for your cat and watching your cat on catnip is fun for you. If you haven’t already, let your cat try a little catnip. Most likely, your cat will thank you for it. If you have any questions or would like to share a story about your cat and catnip, please tell us in the comments below. We’d love to hear from you!